The R Lazy 4 Ranch Cabin is very special. It was built by the family from timber directly from the ranch properties. Privacy is what you get at the cabin. We chose to build this cabin four miles from the main ranch house. It is furnished with all the modern conveniences. The Cabin is your home-away-from-home, with a cozy kitchen, a living room with a wood stove, two bedroom lofts, one bedroom on the main floor, a nice bathroom with a shower and fire wood stacked outdoors ready to be used. The Cabin is also stocked with linens and towels and kitchen things. 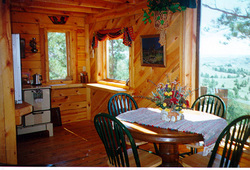 The Cabin is a great place for anniversaries, birthdays, honeymooners, get-away weekends and is wheelchair accessible. Activities at your door include hiking, nature viewing and cross country skiing. Hunting packages are available as well as self-guided hunting maps for hunting mule deer and turkeys. Discounts are available for longer stays. We enjoy our ranch living, and the beautiful scenery eastern Montana has to offer. Some of our guests have come from as far away as Germany and Ireland! For a free brochure or additional information, call 1-800-685-7206 pin # 6030. Bring your own horse and help us move cattle or ride at your own leisure. Four wheelers are welcome. Directions: The R Lazy 4 Ranch is located off of Highway #12 20 miles east of Miles City, Montana home of the 'World Famous Bucking Horse Sale'. Our Ranch cabin is nestled in the beautiful Pine Hills area, some of the best country eastern Montana has to offer.